ETD is pleased to announce the recent completion of a 3-Day training course of replication for the staff of an African based Process Plant. Following on from our recent 2-Day Training Course on P91 & P92 Steel Issues held in Newcastle, Australia on 9th - 10th October 2017, ETD was approached to hold a training course for several of the client’s engineers at ETD’s Offices. 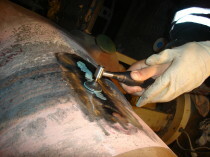 Welding and Welding Repair of P91 Material. After completion of the training course, each participant was presented with a certificate stating that they were now qualified in the aforementioned areas. For more information about our on-site services please click here.